News from IPTLD & Dr.Donato Perez Garcia,MD : FUNGAL DISEASE TREATMENT USING I.P.T. Fungal Diseases are more common than you’d think. It has been said that there are 1.5 million different types of fungi in the planet, but only 300 are health threatening. They usually live outdoors, in damp places, on plants and soil, some fungal spores live in the air or indoor surfaces, mostly. Anyone can get a fungal infection, specially if their immune system is weak. Even biochemical imbalances in the Ph can give entrance to fungal development. Most fungal diseases can be easily treated with antimycotics, but other types need stronger medication as well as a preventive plan, in diet and hygene habits. Too much antibiotic intake can lead to healthy bacteria reduction, which only makes the fungus grow even more. Our I.P.T. 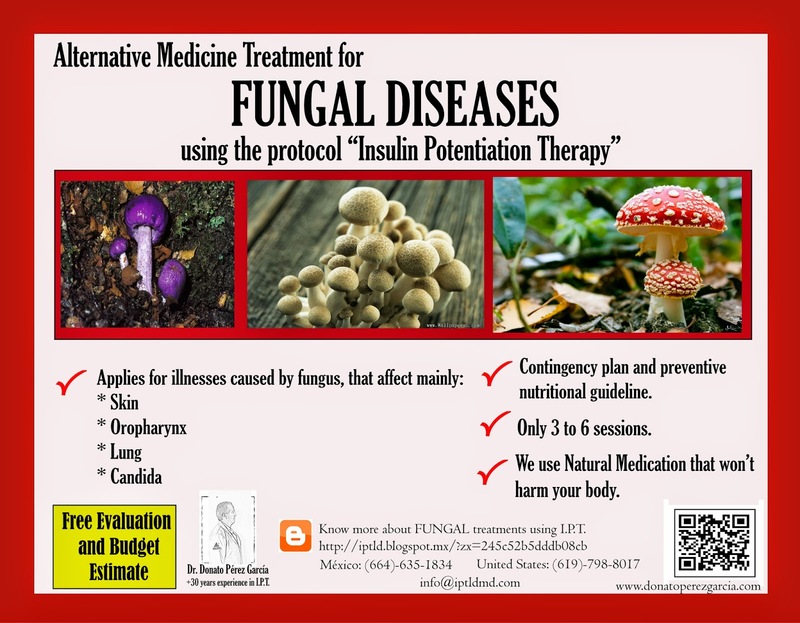 Therapies for Fungal Diseases uses the right amount of anti fungals, deep immune support to strengthen the body’s defenses, nutritional fortification combined with alkaline agents to neutralize acidity, a powerful combination of medicinal compounds of natural (non chemical) origin, that will not damage the body, nor interfere with other medication and help restore balance while completely extinguishing all presence of fungal diseases and spores. We also offer a preventive diet plan to reduce risk of reoccurrence. All our I.P.T. Programs are very affordable and you won’t find better medical care from your treating doctor. If you’d like to apply for your FREE Evaluation and Treatment, call - write or Skype us, Today.